Did the drought really effect the deer this year and will it effect the shed? When do we expect to start seeing sheds on the ground. I know usually the big boys tend to start dropping as early as end of December. Any reports? I say with the weather warmer than normal, Its gonna be late this year….. Always a few early ones and always a few late. Always around the same time for me Time will tell. I drove through Edward Madigan State Park yesterday and saw 8 different bucks all of them had both sides still except one big boy that had shed his left side already. I am starting to get many reports on the big boys shedding.. I have a friend who found a smaller 8 pt’s left side. He also sent me a trail cam picture yesterday, asking my opinion on a “doe”. I said I believe that’s a “hoss with a loss”, given body size and you could just about make out the pedicles. So I believe the older ones are shedding. Many people bring their trail cams in for the year once gun season is over, or a couple weeks after the rut after they see what bucks made it through. I’m a firm believer that keeping your trail cams out year round can benefit a hunter greatly! I can tell when the bucks are shedding, what their patterns are when they aren’t pressured, and how many deer are using your ground. I’ll pull my cards next week to see if I need to get out my hiking boots and backpack. BigT, shoulda followed that big boy around, and convinced him to cross a steep creek or jump a couple ditches! Driving home from hunting yesterday evening, I saw a group of about 40 deer (less then a mile from where I was hunting where there was no deer) and half of them were bucks. A lot a really good sized racks but two real big boys that only had one side. Went out yesterday to check cameras and found 7 sheds with little effort. They are definately starting to drop. Almost all my deer are still holding tight as I saw a few very nice bucks in the clover as I was walking in. 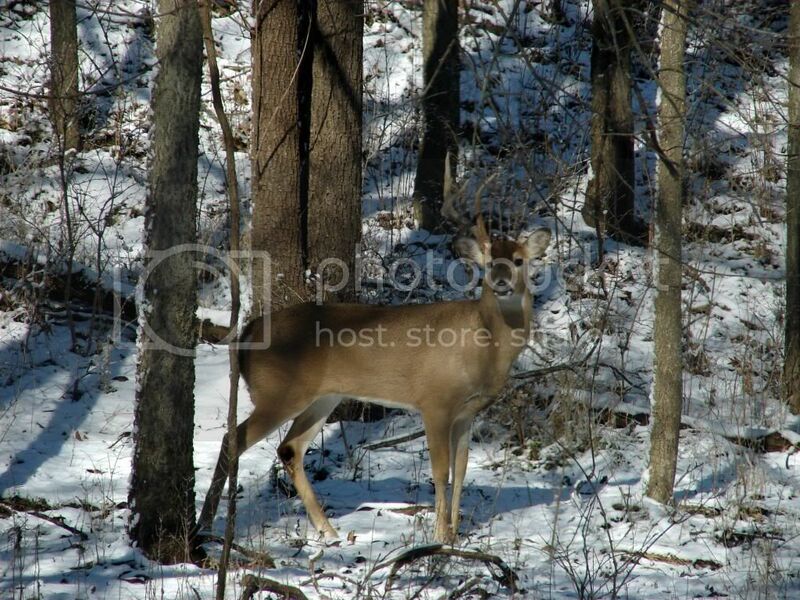 My camera confirmed what I saw with alot of bucks with horns still on. I am going to let property sit until next Sat then really start hunting hard. i checked my trail cams yesterday. All 6 bucks on various cams still had full racks. nice to know theres some big boys that are still around tho. Pulled my card yesterday. 7 different bucks with full racks still, although I only had one of the biggest 3 on camera. And I had one of the 3 last week with a half rack. I think i’ll go out next weekend and see what I can find. how can you have one last week with a half rack, but all 7 with full racks this week? Went out yesterday for couple hours and didn’t find anything this time around. Most of my bucks still holding tight. I saw 3 in food going in and all on my camera still have both sides. I will try again next week if the snow melts.